Bill Stites on his Truck Trike in 2010. 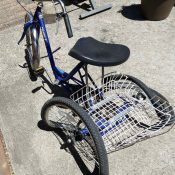 “You are invited to celebrate a new business success story in the making: the creation of the Portland-made “Truck Trike” prototype, which will be used to haul bikes by the nation’s largest bicycle share system, Citi Bike. Alta Bicycle Share is working with Stites Design, the designer and manufacturer of the Truck Trike, to develop a prototype human-powered vehicle that will be used to move Citi Bike’s bikes from station to station, to ensure that bikes are where they need to be as users access the bike share system. Called “rebalancing,” this movement of bikes between stations has been performed by trucks in New York–until now. With the introduction of this prototype, Citi Bike will be the first U.S. bike share system to use a human-powered vehicle for rebalancing. If the prototype is successful, it will be the first of many Truck Trikes to be used by Citi Bike. The Truck Trike uses a combination of human and electric power to move, and carries loads of up to 600 lbs. After the prototype test, Alta Bicycle Share, which manages Citi Bike, will order more Truck Trikes for use at Citi Bike, creating a maneuverable and clean vehicle for New York streets and jobs and economic growth in Portland. The economic impact of bicycles in Portland’s economy has been estimated at more than $100 million to date. Stay tuned for a first look at the new trike. For more about rebalancing, check out our behind-the-scenes look at how Capital Bike Share workers in Washington D.C. go about it. 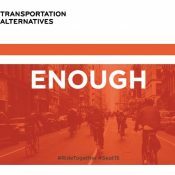 Does anyone know the source for the estimated economic impact of bicycles in Portland that Alta cites? The number doesn’t sound right. PSU estimated $63m ANNUAL economic impact 5-6 years ago. 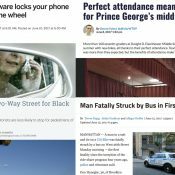 Not sure how they calculate “economic impact,” but Chris King alone claimed $10M annual revenue in 2012 (http://www.businessweek.com/articles/2012-12-14/portland-bike-maker-sees-made-in-usa-demand-from-overseas), so $100M total impact sounds low. 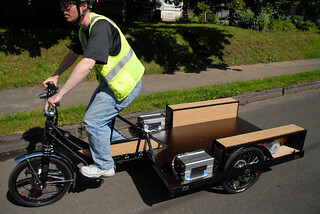 The economic impact study referred to in the Truck Trike press release was covered on BikePortland in 2008. So yes, the number has likely grown higher since then. Way to go Bill! This guy supported my senior project at OSU several years ago. Good to see he’s going strong.